By Chitra Nagarajan and Rhiannon Redpath, writing for No women, no peace. As Laura mentioned, our campaign focuses on women’s rights in Afghanistan by working with women’s rights activists and organisations in Afghanistan and mobilising activists in the UK to hold the UK government to account. When you think about women in Afghanistan, chances are you will think of Aesha Mohammaszai whose face appeared on the cover of TIME magazine in 2010. Perhaps you remember Najia Siddiqui, a senior women’s affairs official, who was shot dead on her way to work last year. Alternatively, perhaps the story that sticks with you is that of Mah Gul, beheaded by her family for refusing prostitution. Each of these stories has been reported by the UK press, and they come together to create a powerful discourse around what life is like in Afghanistan for women. In Afghanistan, as in most parts of the world, violence against women and girls is endemic in society. More than 87% of Afghan women experience domestic abuse, 70% – 80% of marriages are forced, the biggest fear of women under 30 in Afghanistan is sexual assault and women human rights defenders are the targets of violence, harassment and targeted killings. Whilst this is true there is a much more nuanced picture that is often missing from discussion. What we do not see reported frequently is the vibrant and strong women’s movement. We do not hear stories of women who are organising, mobilising and acting as a force for change. When you think of Afghan women, do you think of Noorjahan Akbar, blogger, activist and co-founder of Young Women For Change who is mobilising young women and men in a grassroots feminist movement? Do you recall Fawzia Koofi who is due to stand for president in the 2014 elections? Have you heard of Samira Hamidi, former head of the Afghan Women’s Network? This year is a crucial time to act on women’s rights in Afghanistan, with international troops due to leave the country in 2014 and transition talks well underway. So much has been achieved in Afghanistan for women’s rights. This includes women in parliament, girls in schools, the constitution enshrining equal rights and a law to eliminate violence against women that criminalises killing in the name of ‘honour’, child marriages and giving away girls to settle disputes. However, the progress made is far from sufficient and remains fragile. The UK must support women’s rights and ensure women are part of discussions about the future of their country, that women’s rights remain central to the constitution and that UK funding goes towards women’s rights and wellbeing. We have lined up a series of posts from our member organisations here in the UK and our partners in Afghanistan. We hope this guest series will create more informed and nuanced discussion around Afghan women’s rights and build links between feminists in the UK and feminists in Afghanistan. Join the No women, no peace. campaign, take action and support Afghan women here. 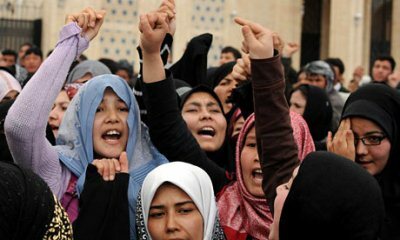 The photo shows a group of Afghan women in headscarves at a protest, shouting and raising their arms. Great article. Revolution cannot happen without women neither can peace. Not true peace anyway.